AIX is the world’s most extensive aircraft interiors event, and we will showcase our latest innovations in in-flight connectivity (IFC) and in-flight entertainment (IFE). 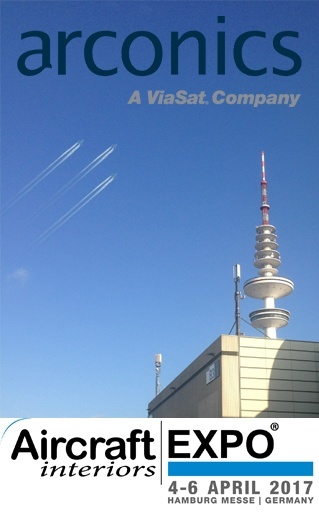 Arconics will have a strong presence at AIX 2017, along with our colleagues from ViaSat, and we will display our full suite of connected apps for aviation, from high-capacity satellite connectivity for W-IFE to the world-leading AeroDocs safety and compliance document management system for airlines. Let’s meet in Hamburg at AIX 2017. Just click here, or on the orange button, and tell us when suits to meet at stand 2B30. We are also attending the Passenger Experience Conference (PEC) immediately before AIX, so we’re available across the week, at any time that works for you and your team. Passenger Experience Conference – Monday, 3 April, 2017. AIX Day One – Tuesday, 4 April, 2017. AIX Day Two – Wednesday, 5 April, 2017. AIX Day Three – Thursday, 6 April, 2017.